Data security is an important part of the backup strategy. You must protect your information from unauthorized access, especially if you back up sensitive VM data to offsite locations or archive it to tape. To keep your data safe, you can use data encryption. 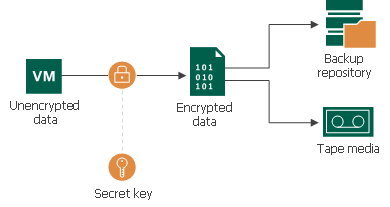 Data encryption transforms data to an unreadable, scrambled format with the help of a cryptographic algorithm and a secret key. If encrypted data is intercepted, it cannot be unlocked and read by the eavesdropper. Only intended recipients who know the secret key can reverse encrypted information back to a readable format. Veeam Backup & Replication uses the block cypher encryption algorithm. Encryption works at the source side. Veeam Backup & Replication reads VM or file data, encodes data blocks, transfers them to the target side in the encrypted format and stores the data to a file on the backup repository or archives the data to tape. Data decryption is also performed on the source side: Veeam Backup & Replication transfers encrypted data back to the source side and decrypts it there. Beside the job-level encryption, Veeam Backup & Replication allows you to encrypt network traffic going between the primary site and the disaster recovery site. Network traffic encryption is configured as part of global network traffic rules that are set for backup infrastructure components. For network traffic encryption, Veeam Backup & Replication uses the 256-bit Advanced Encryption Standard (AES).